INDIA, KUSHAN: Huvishka Gold dinar, Elephant-rider/Oesho (Siva) EXTREMELY RARE and CHOICE! 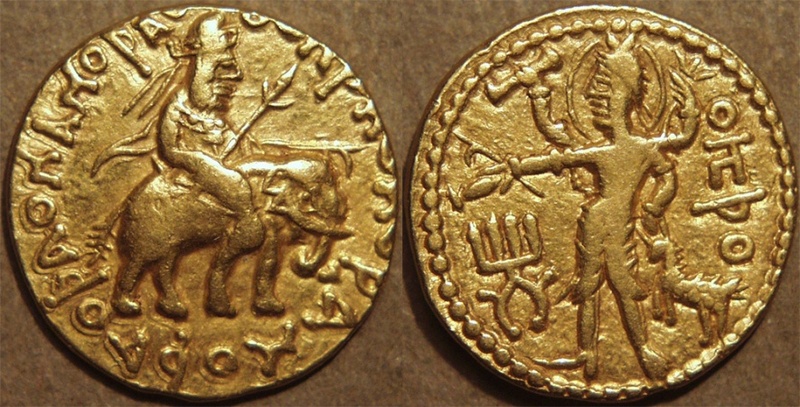 Obverse King riding on elephant right, holding trident and ankus, or elephant goad, Bactrian legend around (at 8 o'clock): þaonanoþao ... oohþko koþanoþao (shaonanoshao ooeshko koshanoshao ... King of kings Huvishka, king of the Kushans). Reverse Oesho standing facing, holding trident in raised left hand, antelope in lowered left hand, damaru or drum in raised right hand and goad and water pot in lower right hand, Bactrian legend at right: oηþo, tamgha at left. Comments One of the rarest and most sought-after gold coins of Huvishka, in wonderful condition; unlisted in Göbl's Kushan "atlas". INDIA: KUSHAN, Huvishka AV dinar, Oesha reverse. EXTREMELY RARE and SUPERB! INDIA, KUSHAN: Huvishka AE tetradrachm, Elephant-rider/Oado. VERY RARE! INDIA, Kushan: Huvishka bronze belt plaque or brooch, RARE and CHOICE! INDIA: KUSHAN, Huvishka AV dinar, Mao reverse. SCARCE and CHOICE!